A popular book in the late Middle Ages was the story of the travel adventures of Sir John Mandeville. Although Mandeville was said to be an Englishman, the text incorporates a wide range of earlier material, and is focused on the Near East. The story was translated into Czech, and the framed images in this manuscript illustrate the first thirteen chapters of the Czech text. The illustrations were painted on an unusual green preparatory colour, probably in Prague in the second decade of the fifteenth century. 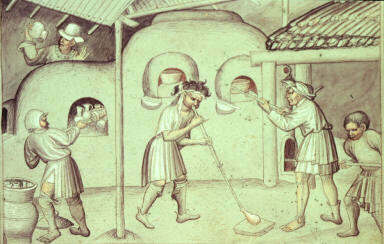 This one represents faithfully activities in a Bohemian glassmaker’s workshop.